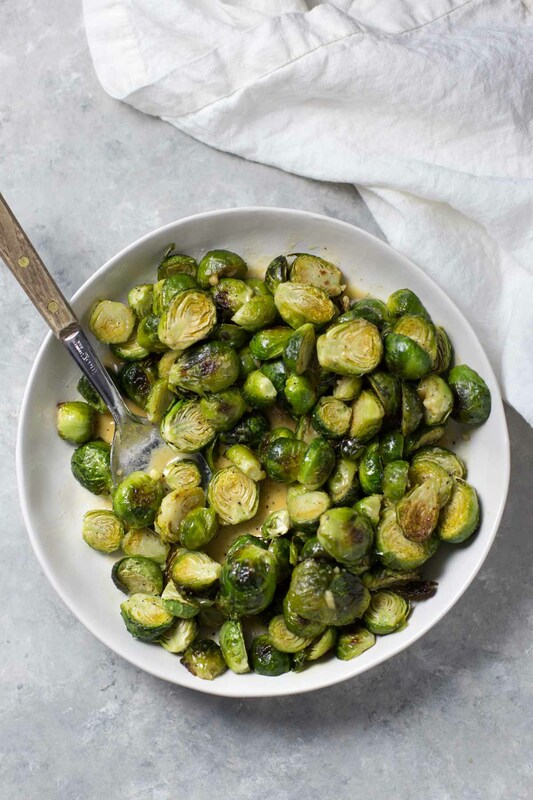 In this warm Brussels sprouts salad, roasted sprouts are drenched is a tangy orange miso dressing for a simple, flavorful side dish that will make even the pickiest eaters love their Brussels sprouts. 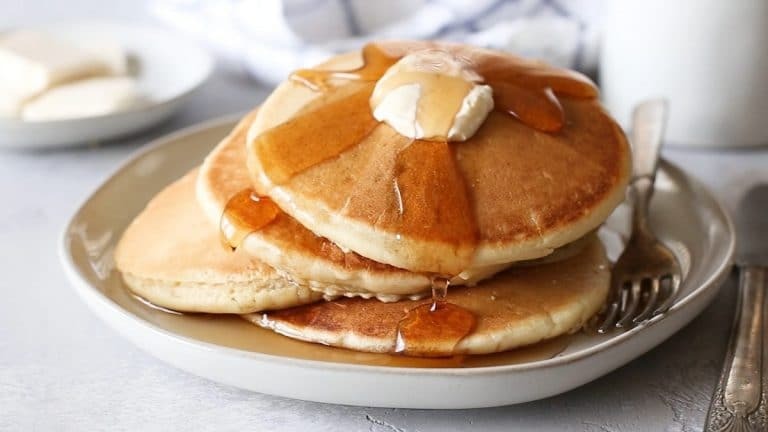 This recipe is as easy as could be. You can make the dressing while the Brussels sprouts are roasting and when they’re done you just pour and serve. 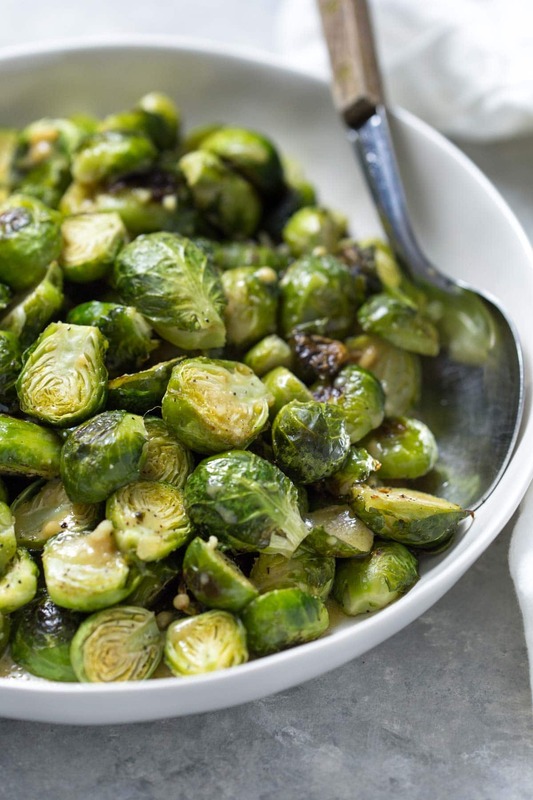 The fresh, vibrant flavor of the orange pairs really well with the Brussels sprouts and it’s a refreshing change of pace for a cold weather vegetable. I’ve apparently become obsessed with Brussels sprouts lately. 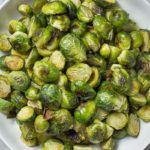 I’ve been experimenting with them in all sorts of recipes – from pasta to salads – and a few months ago, I made pasta dish from one of my favorite cookbooks that called for orange zest and Brussels sprouts. I was a little reluctant, but since I was trying to use what I had in my pantry/fridge, I went with it. Turns out, the two pair really nicely together, and I was really impressed with the dish. Of course, now that I’m trying to eat a little healthier and lose baby weight, carbs are not on the top of my list. So, I thought I would find another way to enjoy those flavors without the added carbs. This warm Brussels sprouts salad is definitely the way to do it. The orange miso dressing is on the healthier side – with much less oil than I’d normally use in a dressing – and it’s bursting with flavor thanks to the orange and miso. How do you make a warm Brussels sprouts salad? It’s easy. You simply cut the Brussels sprouts in half. 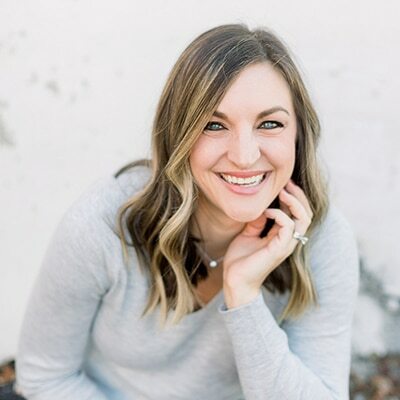 I normally buy pre-washed ones because I find that they’re better quality and I can save a whole step, but you can do what’s better for your wallet and your time. I still rinse make sure to discard any large stems or not-so-nice-looking layers. Then I toss them in olive oil and salt & pepper before roasting in the oven for about 20 – 25 minutes. You want them to be fork tender, and I like when the outer layers get a tiny bit crispy and browned. While the Brussels sprouts are roasting, make the dressing. In the same bowl you used for coating the Brussels sprouts in olive oil, whisk the ingredients together. Leave the dressing in the bowl until the Brussels sprouts come out of the oven. 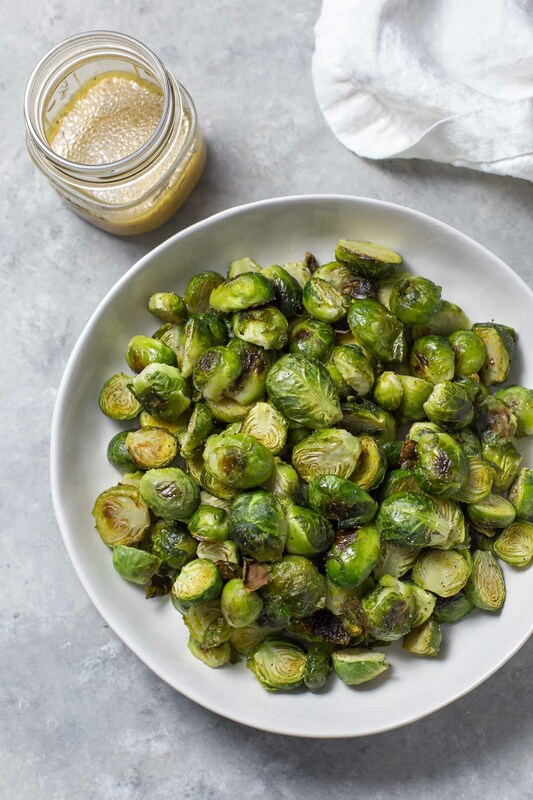 When you take them out of the oven, make sure they rest for a few minutes, and then put them in the exact same bowl that you used to make the dressing and stir them around until the warm Brussels sprouts salad is coating evenly in dressing. Those Brussels sprouts layers are going to soak up all the orange miso dressing and make the most amazing warm Brussels sprouts salad ever. Trust me. Make sure you keep the salad warm before serving. Plan for about 5 – 10 minutes between taking them out of the oven and serving them. 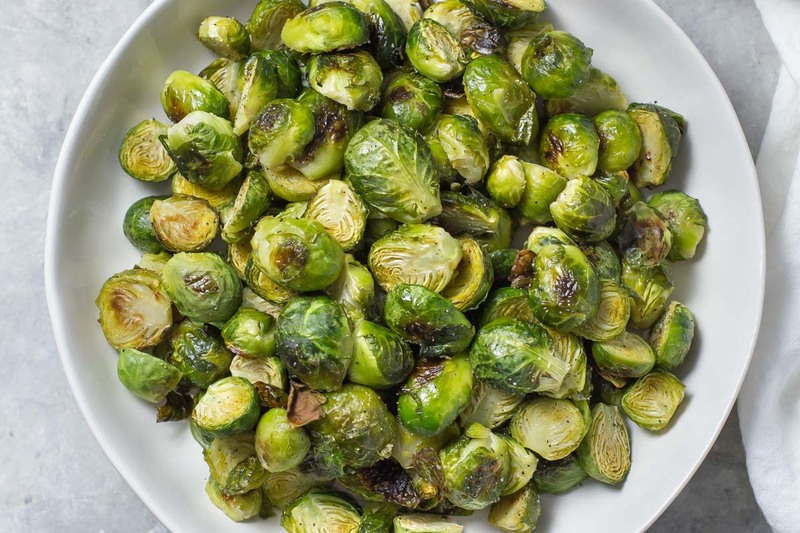 Roast them to perfection: the edges of the sprouts should be crispy and brown and they should be fork tender. If they aren’t, leave them in the oven for about 5 more minutes. Only use one bowl for prep. You don’t want to make a bigger mess than you need to. Preheat oven to 400˚F and line a baking sheet with parchment paper or foil. 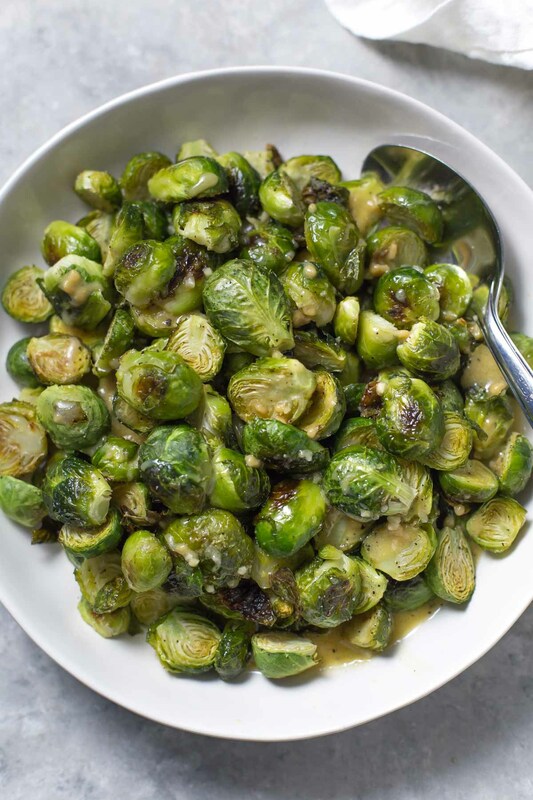 In a large bowl, toss Brussels sprouts with oil, salt and pepper (or spray with olive oil cooking spray while on baking sheet before seasoning). Transfer to baking sheet and bake for 20 – 25 minutes, until sprouts are tender. Using the same bowl, whisk dressing ingredients together. Remove Brussels sprouts from oven and let cool for several minutes. Return them to bowl and toss with dressing to coat.